Reviving the Unknown. 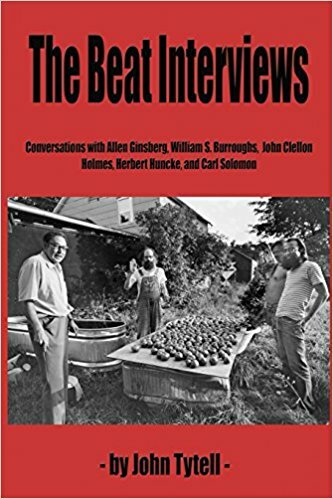 Review of: John Tytell’s The Beat Interviews: Conversations with Allen Ginsberg, William S. Burroughs, John Clellon Holmes, Herbert Huncke, and Carl Soloman. Beatdom Books 2014. John Tytell’s The Beat Interviews provides additional insight into a number of Beat Generation personalities by detailing interviews he conducted years ago. John Tytell is a well-regarded scholar of Beat studies. His bold 1976 Naked Angels was one of the first academic books I read on the Beat Generation, so I have a special respect for the quality of his scholarship. Tytell’s writing is always accessible, though at the same time he remains aware of the critical debates in the field. The Beat Interviews continues the long tradition of providing informal anecdotal information about Beat lives with additional scholarly observation. The volume includes sections on Beat philosophy, William Burroughs, Carl Soloman, and Allen Ginsberg. The interviews were conducted in the 1970s, and they appear in this collection for the first time. The Beat Interviews will be especially interesting to popular audiences already familiar with the Beat Generation, as well as to academics wanting to learn more about the cultural mythology of the Beats. While it is impossible to review every interview in detail here, a look at representative examples will provide a good idea of the content and direction of the larger collection. In the chapter entitled “Origins: An Interview with Herbert Huncke,” Tytell digs into the mysterious Herbert Huncke personality that brought humility, doggedness, and street wits to the Beat vision. I am not nearly as familiar with Huncke as I am with the core writers of the Beat Generation, so this interview was new for me. When I think of Huncke’s most important link to the Beat Generation, I think of the “quest for forbidden experience” which all core members shared and wrote about (1). I find that Tytell makes some rather bold claims. For example, he argues: “In one week in the winter of 1945, he [Huncke] introduced Burroughs, Ginsberg, and Kerouac to morphine and redirected the course of American letters” (2). I think that even though Huncke brought a true Beat(en) sensibility to the group, Ginsberg, Kerouac, and Burroughs deserve complete credit for their writing. Suggesting that Huncke was somehow a significant creative force behind their work diminishes the creativity of those writers, at least to me. Nonetheless, the interview with Huncke provides additional context regarding the initial emergence of the Beat Generation. I was particularly interested in section three of the book, as it focused on William Burroughs. I am already very familiar with the critical and biographical research carried out on Burroughs. I was surprised to discover new information about the publication history of Queer here. I have always wondered why the inflammatory Naked Lunch was published in the 1950s while Queer was not released until decades later. Burroughs clearly explains here that his publisher at Ace thought the writer was bound for jail were the book to be released. It is essential to note here that Oliver Harris’ introduction to the new edition of Queer clears up some of the confusion about Queer that has existed over the years, especially in terms of the publication history of the book and how it fits with the misrepresentations of Burroughs over the decades. In Tytell’s book, he further explains that Burroughs sought a place for himself beyond the Beat Generation label. He writes that Burroughs saw his writing as different mainly “because of stylistic differences” (92). However, this is not new, and reinforces the ambivalence core members of the group sometimes felt at the Beat label. In the final section on Burroughs, Tytell is critical of much of contemporary Beat scholarship. Bemoaning what he sees as an overemphasis on biography, Tytell says: “Much of what has been published has been disappointing, confounded by myth and presented more for the sake of sensation than truth – sloppy research, undeveloped literary skills, or a myopically narrow focus” (116). Holding nothing back, Tytell claims: “If biography has any value beyond gossip, its purpose should be to reveal the mask and what it is hiding” (123). Such criticism seemingly advocates a change in approach to Beat studies. Tytell stresses, “what is needed now is a more interpretive approach” (123). I find this comment spot on, though I can imagine many in Beat studies in strong disagreement. However, I do think it is appropriate that such a senior scholar within Beat studies is willing to comment on the current state of the field. He has certainly earned that right. The chapter entitled “Requiem for Ginsberg” describes Ginsberg’s final days as well as his enduring legacy in American letters. Tytell is forthright about the importance of the author to American poetry and declares: “Allen Ginsberg opened the doors of poetry, of perception, of a freer life . . . He was the greatest poet and teacher I’ve known” (168). This chapter is remarkable not because it details new information about Ginsberg. Instead, what I found significant is the way that Tytell discusses his own interactions with Ginsberg over the years. He contrasts memories of a younger Ginsberg with descriptions of the author’s last days. Tytell explains that one of the things that made Ginsberg so successful was the fact that he never burned out, and remained extraordinarily productive until the very end. He goes on to tell us that Ginsberg was our “Zeitgeist poet,” and that we should remember him as such (174). After reading this chapter, it is clear that Tytell felt an intense connection to Ginsberg and his work. The message conveyed is that Ginsberg’s death makes all of us mortal. The content of The Beat Interviews is interesting, and while there are some problems to the structure of the book, it is a very good read. The Beat Interviews would have benefited from a proper introduction and conclusion. Instead, we are thrown directly into the interviews with no context. Tytell has a full career of Beat reflection, and he could have made a better case for the future direction of Beat studies. Tytell does accomplish this to some degree in the commentary he provides in later chapters, but such statements might have been more persuasive had they been made in an introduction. I have other minor gripes. In terms of presentation, the book feels a bit rushed. There are minor typographical errors throughout that distract the reader from the content. At the same time, I also understand that this not a typical academic book. Tytell needed to publish this book, and I wonder what other gems he still has in his possession awaiting the light of day.